From Goodreads ~ Detective Lindsay Boxer has everything she could possibly want. Her marriage and baby daughter are perfect, and life in Homicide in the San Francisco Police Department is going well. But all that could change in an instant. Lindsay is called to a crime scene at the Four Seasons Hotel. There is a dead man in one of the rooms, shot at close range. The man checked in under a false name with no ID on him so the first puzzle will be finding out who he is. Lindsay is a detective with the San Francisco Police Department. She and her team are called out when a man is found naked and shot in a hotel. In the room next to his are two young people, who appear to have been spying on the man, also shot. None of them have any ID. Hotel footage show a beautiful woman entering the hotel and the man's room but that's all they have. As Lindsay and her team keep digging, she discovers that there could be international espionage involved. In the meantime, her husband, Joe, who is a former FBI agent and Homeland Security agent and is now a consultant, had disappeared and hasn't been in contact with Lindsay. So in addition to solving the hotel murders, Lindsay now wonders whether her husband is still alive. 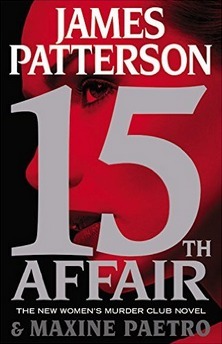 This is the latest (the fifteenth) in the Women's Murder Club series (I've read them all). Though it is part of a series, it does work as a stand alone. There are four members of the Women's Murder Club ... Lindsay, Cindy, Claire and Yuki, though the focus is on Lindsay. The ladies do get together a couple times but the time is spent delving over Joe's disappearance, not fun stuff. In this book, Yuki is basically non-existent. Lindsay seemed more mad than concerned that her husband was missing. I liked the writing style and it went at a good pace. I liked the short choppy chapters. I thought this book was okay ... it was a bit much, though, with the crazy storylines. The point of view shifted ... it was first person perspective when the focus was on Lindsay and third person perspective when the focus was on everyone else ... but it was easy to figure out. As a head's up, there is swearing, adult activity and violence.